Some members prefer to wait at least 24 hours to see who responds to an offer. The first to reply is not always the most reliable. The delay gives a fair chance to people who receive notifications in What’s New summaries, or who don't have continual access to the Internet. It may give a choice of potential recipients, and careful selection could avoid 'No Shows'. 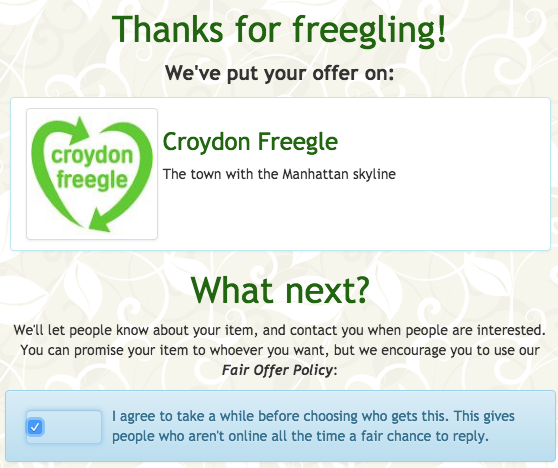 If you want to do this regularly, a tick box is available, which shows after you have made an offer. Once ticked, it will appear on all your offers. If you are likely to prefer a quick collection sometimes, it would be better not to tick the box: you could still add a note when you do intend to delay making your choice. This page was last modified on 5 January 2018, at 18:39.